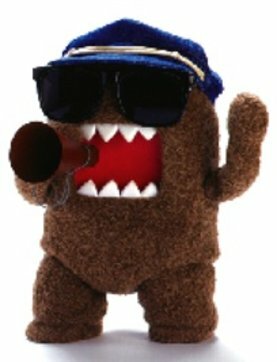 "Everything Domo, all the time." I am a brown and fuzzy creature that was hatched from an egg and I am the last of my kind. I don’t know where I came from but I like to do adventurous things and explore the world around me. I live with Mr. Usaji, a wise and old rabbit, and Maya and Mario--they're bats. I have several friends like Tashanna who dreams of being a fashion model; Hee and Haw, the flower pixie twins; Bear Boy and many others. I am interested in everything: I love to play baseball, run after bears, photograph ghost and everything in between. I like the thrill of everyday life. I love TV movies; I watch everything on TV, it makes life interesting. I love Music: Rock, punk, rap, Chinese rap, Japanese rap, opera, African drums. I love it all. Watch me rock out on Domonation.com.